Welsh barber now in the running to be crowned British champion of the wet shaves. A female barber from Gwynedd is celebrating this morning after being crowned the Welsh champion for the second year running in a national competition to find Britain’s best wet shaving barber – and securing her place in the final round of the prestigious tournament. Sophie Collins, owner of Soph’s Barbers in Llanbedr, Ardudwy, beat off razor sharp competition from scores of other talented barbers at the Welsh regional final in Griffithstown in Britain’s Best Shave 2018. Sophie impressed the judges on a number of criteria, including shave preparation, razor technique, post-shave routine, health and safety and overall efficiency. As well as winning the coveted Welsh title, Sophie, 26, will now go on to compete in the national final against seven other top barbers from across the country at this year’s Barber UK. 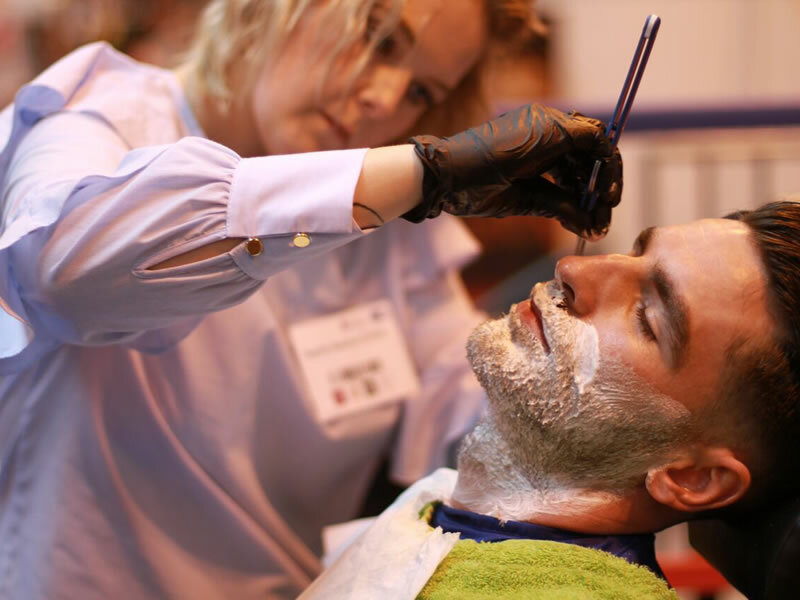 The two-day barber show takes place at the Birmingham NEC on 20th and 21st May, and promises to be a bigger and better celebration of British barbering than ever before. The final will take place inside the legendary boxing ring and will attract hundreds of spectators throughout the day. Sophie said she was delighted to retain the coveted Welsh title, but was determined to go one step further this year and win the British crown. Barbering is one of two passions for biker Sophie, who has been nicknamed ‘The Cut Throat Racer’ because of her love for motorbike racing. Now in its fifth year, the annual competition, run by industry watchdogs the British Barbers’ Association and premium male grooming brand The Bluebeards Revenge, is fast becoming the most coveted competition of the barbering industry. Trevor Studd, director of the British Barbers’ Association, suggested that the ever-flourishing trend for men’s grooming was showing no signs of slowing down.